A long long time ago, tone controls were the norm, as we have advanced into the digital age the *perfect sound forever* that we were promised has become a tatty dream and we now see a resurgence of *old technology* such as Valves and Vinyl being revived with some gusto. The Z-Systems RDP-1 is a product that combines some of the *old Technology* (tone controls) with the latest and greatest SOTA Digital implementation. What is this unit that people are starting to rave about you may well ask. The RDP-1 is a digital preamp, a source convertor (EAS/EBU, SPDIF, Toslink IN, to any of the aforementioned OUT). It is also a wordlength matcher (converts 16 bits in to 16, 20 and 24 bit dithered or undithered (noise shaped) out) and most importantly it is a truly transparent Digital Parametric Equalizer. A parametric equalizer is a tone control where the level of boost or cut, the centre frequency it acts upon and the slope of the equalization curve are user configurable. I will discuss the relevant functions in a bit more detail later on. On discovering a massive 40 Hz resonance in my listening room I had to find some sort of cure. I have always been fascinated with cutting edge technology and having a purely digital system (Meridian 508.20 + 518+ DSP5500 speakers) and having a wife that flatly refused bass traps or the like - I had to get some sort of digital equalizer to solve this bass problem. There are solutions in the Pro audio world but most introduce artefacts that are just not acceptable to Audiophiles. I had read about the Z-Systems RDP-1 digital parametric/pre, took the plunge (at $5000 for the unit it was more like a high-dive) and ordered one. 2) True transparent digital attenuation (the Resolution never drops below 20 bits) with a -99 to +12dB range. The digital attenuation has very small steps, around 0.2dB the closer to unity gain you get and then as you get closer to the -99dB mark the steps get larger and larger - a rather sensible idea that works very well, in fact all of the gain circuits on the RDP-1 work this way. 3) Wordlength matching: the RDP-1 will take a 16 bit input (a 24/96 input board is an option) and convert it to either 16 or 20 bits dithered or undithered or 24 bits undithered output - this helps to match the RDP-1 to the DACS resolution. Using a RDP-1 requires a different approach to the norm. 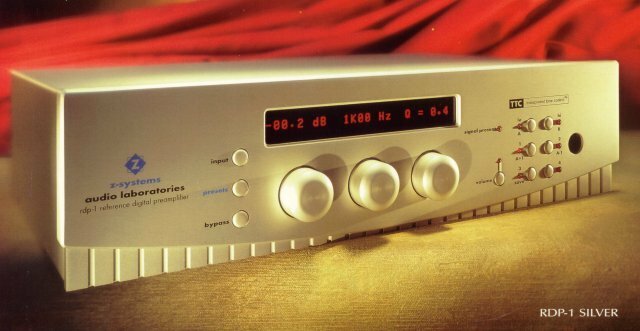 The CD front end has prior to this been treated as an analog component, Transport/Dac to Preamp to amp, one must now view the digital unit (LD, CD, Satellite) as the traditional *source* and the DAC and amplifier as a single unit - the RDP-1 acting as a pre drives the DAC/amp combination. (needless to say - those of you with analog sources will be bereft of the preamp function of the RDP-1) This keeps the signal in the digital domain as long as possible and performs all modification of it in that domain. 5) A digital Parametric: This is where the RDP-1 comes into its own, it is a 4 band Parametric and has both Hi an Lo shelf filters.There are 100 presets where individual combinations of the parametric as well as input/output sources are stored - in fact every user configurable aspect of the RDP-1 apart from volume (for safety reasons) can be stored in these presets. The RDP-1 defaults to preset 99 on power up and sets attenuation at -40 dB (so you don't blow speakers). Apart from that it has a few very nice feature associated with the memories - you can load up 2 presets and go into an A/B comparison mode, you can increment/decrement any preset you loaded and you can bypass the unit entirely. ALL user functions are acessed either directly on the unit or via the remote control. Build quality is excellent - The remote is solid aluminium billet and falls easy to hand. The unit has a very good fit 'n finish and can be ordered in black or silver, it has a thick front plate, looks elegant and the manual is comprehensive and is easy to read with some excellent essays on dither, tone control, digital attenuation included. The unit is intuitive to operate and has exceptionally good controls, it is easy to set up being basically a plug and play device. The red alphanumeric display is relatively informative and is easily read from near although from a distance it becomes a bit obscure. The operation of selectors, knobs and the remote have a very good feel - positive clicks of buttons and smooth and silky operation of knobs - the unit looks and feels like quality. I do have a Meridian 518 digital mastering processor/Jiytter-buster which does duplicate a few of the RDP-1's dither and wordlength matching functions - thus I set the RDP-1's digital attenuator to unity gain and used a full 24 bit word out - basically using the unit as a parametric. I set the 518 to 24 bit in and 22bit dithered out (the DSP speakers DACS want that output setting) and also set its attenuation at unity gain. The DSP speakers have their own attenuation, thus I left the speaker to do this job. A) To try compensate for room anomalies - which I have successfully achieved beyond my wildest dreams B) As tone controls to compensate for recording or tonal abnormalities, poor mastering and EQ to personal taste, which the digital parametric allows me to do almost as successfully as A), and C) To correct for speaker/equipment deficiencies. My room anomalies were in the main subtractive - I had to cure gross bass peaks within the limitations of speaker placement, furniture and spouse approval. The curative inverse curve for the bass response in my room wasn't subtle at all a -16dB, 40 Hz (centre freq) notch filter spanning an octaveand a1/2, combined with a -3dB filter at 31Hz (spanning an octave and bit) as well as a -5.4dB filter set at 63 Hz with a relatively steep slope. My DSP speakers can do this too - but with FAR less precision than a parametric can - the combination of a 4 band digital parametric, hi and lo shelving filters as well as the inbuilt DSP of the Meridian speakers equated to a VERY powerful EQ tool. Having said that - I tended to set the speakers to flat and used the RDP-1 exclusively to modify sound. What started out as boomy muddy overblown sound, where the true nature of the mids and treble was being hidden by the hugely fat bass, ended up as fast, detailed (yet not etched) open and airy sound, with precise imaging and soundstaging and a bass that approached the best I have ever heard and a midrange purity to die for. No ways would room treatment have provided this and chopping and changing any component would have been as useless. To give an example of how a poor recording can be *remastered* I took a Great Mingus recording, the performance was exceptional but the recording was poor - and equalized it. By G_D -it sounded a hang of a lot better than I have EVER heard it. I then used the RDP-1 as a stand alone unit - using 20bit dithered output and its preamp functions in to the DSP5500 speakers, bypassing the speakers attenuation and the Meridian 518 mastering processor. Once again it was totally transparent - and from the lowest level of attenuation to the highest, introduced NO digital hash whatsoever - in fact in this mode, bypassing the 518, it was actually better for some types of music than others. Dynamics improved, transient attack got better and tonally there was no change whatsoever - with vocals being frighteningly realistic and uncoloured and kickdrums and other percussion instruments having explosive qualities. The Meridian 518 tends to give the music a *spacious* sound and softens things to some degree in terms of focus, pace and *bite*, the RDP-1 in bypass mode was identical to running the transport into the speakers, and in its normal mode, once again transformed the sound. On jazz it was wonderful, I did however prefer the effects of the 518 in the loop for female vocals, classical and new age type music, but this had NOTHING to do with the effects of the RDP-1 - it was merely my personal taste and thus left the 518 in the system. OK - this was in a relatively modest $16k+ system, now how did it perform in other systems, and what is it like as preamp? How does *transformation* in a $120k Mark Levinson /ProAc Response 4 System grab you? How Does *throw away the Mark Levinson pre-amp* grab you? How does increased transparency, dynamics, attack and superb bass grab you? It sure as hell grabbed the owner of this systems attention!!!!! I felt the sound out of this top of the range ML equipped system (Using some serious interconnects like Transparent and Purist Audio Dominus) was HIFI like, clean, analytical, a little boomy in the bass (room), generally soulless and lifeless with a very ill defined soundstage. Using the RDP-1 as a preamp only - cured a lot of these problems - the soundstage and imaging changed dramatically allowing a close look into the musical fabric, dynamics and openess improved, yet lost that etched sound, bass firmed up slightly and the slight coloration to female vocal (I'm being VERY petty here) was gone - I don't remember the exact model of the ML pre being used, but it was one of their latest and greatest. This transformation alone was an eye-opener and would make the $5000 asked for the RDP-1 worth it as a preamp alone. Add the equalization and the system sang. I must say that despite the RDP-1's improvements, I didn't like the sound of the system much, but once again - I am being biased by personal preferences. Next I got hold of locally made 3 way speakers ($1800 Sonor VKIII's) and a set of local 130 watt push pull valve amps (Steinhart TVP -777 MkII - a superb piece of gear by the way and a bargain at $1350 per monoblock), a Meridian 508.20 as a transport and a Theta progeny DAC. The system was using a top quality locally made passive pre (Remote control, Also by Steinhart about $350). Room acoustics with this setup were actually VERY good and very little bass eq had to be applied. Once again the RDP-1 strutted its stuff - with much the same improvement as in the aforementioned system being obtained when used as a pre-amp. The speakers themselves were a limiting factor in this setup, having a recessed midrange and a slightly tizzy treble, bass roll-off was rather high at 42 Hz or so (surprising for a 10" Vifa woofer and a big cabinet) so some judicious eq was applied and the system once again was transformed. The owner of this system was very impressed but his financial position and commitment to achieving the *ultimate* sound was lacking, he felt the $8k he had spent on his system was enough - and the admission price of the RDP-1 was beyond his means and what he felt was a reasonable price to achieve these improvements. I must admit, he had put together a particularly synergistic system and quite frankly I felt his sound beat the $120k+ system in musicality and all day listening pleasure. I have been the Purist route "the straight wire with gain" thing and also done the EQ thing on and off in the 20 years I have been in audio. The new wave of DSP engines and digital technologies are here, making studio grade and even better then studio grade tone control available to the public. Having the Digital parametric in my system was a revelation in many respects : in the A/B mode where you can load in 2 settings and instantly A/B between them - you need some fairly big deviations over a pretty broad band to instantly tell differences between settings, when you start at the <300Hz mark - typically +-1-2dB over at least a 2 octave band - Above 700 Hz or so +-0.5 to 1.5dB change is enough to tell differences when doing instant switching. As you steepen the slope with any equalization it becomes increasingly difficult to hear differences. BUT - on longer term listening - smaller dB differences are much more noticeable - thus quick A/B switching between components at a Audio store seems to be relatively useless as to hearing minor tonal differences. There would have to be quite big differences to reliably tell the units apart on short burst listening sessions. Equalisation CAN'T change transient handling abilities of the equipment and it CAN'T change room reflections and room problems in the HF range (apart from attenuation or boost) (note by WO: the SigTech room equalizer does this!) and it CAN'T change fundamental system flaws (like one note bass ) and it CAN'T do anything about distortion, cone break up and the like. This is a sophisticated and a very high quality piece of gear, if you have the money and a system that can use or benefit by it, I thoroughly and unreservedly recommend the RDP-1 as a top notch transparent digital equalizer and more importantly a digital Pre-amp. Once you have heard what it can do to your system - you WILL want one - It provides endless hours of *tweaking* fun without any effort or additional expense, and teaches you the rudimentarys of what instruments and sounds are affected by which frequencies. What would have been nice, is if Z-systems had included a demo disc, with some examples of mastering techniques - some instruments and their frequency operating ranges and a full series of test tones with the unit. Z-Systems Web site is at http://www.z-sys.com and they are more than willing to have a discussion with you or help out on any technical query. Please refer to our Editor's Inter.view with Glenn Zelniker, President of the Z-Systemd Audio Labs.